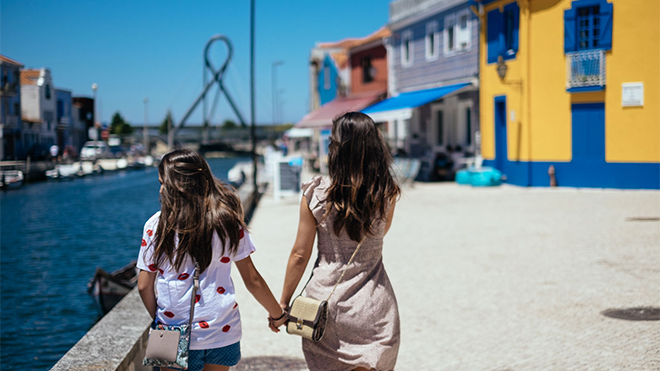 For many centuries with its history linked to the sea and fishing activities, Aveiro has a special environment that is due to the three channels of the Ria which enter the city, creating reference axes and a natural division between the oldest and the newest neighbourhoods. For the visit we suggest an Accessible Itinerary covering several points of interest. You can supplement this with a trip on the ria in one of the traditional, colourful moliceiros (boats originally used to harvest seaweed). 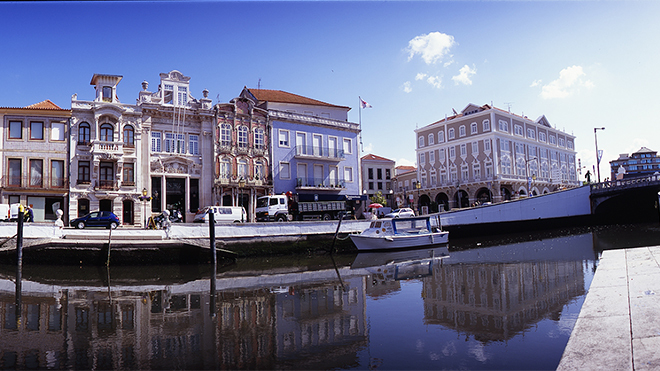 The city of Aveiro is virtually flat and the surfaces are in a good state of repair and smooth, so getting around is easy and safe. To prove it the fact that the bicycle is a popular mode of transport, which motivated the City Hall to provide a system of free public bicycles. In the Historic Centre the pedestrian crossings have sound warnings and vertical light signalling. Here and there the footpaths are not lowered, or the surface is in parallel strips, made from basalt, causing some vibration and irregularity when crossing. There are a lot of terraces throughout the city, particularly in the pedestrian streets, so extra care is needed getting around. In a city so accessible for getting around, however, you find that buildings and commercial establishments often have steps at the entrance, which makes wheelchair access difficult. 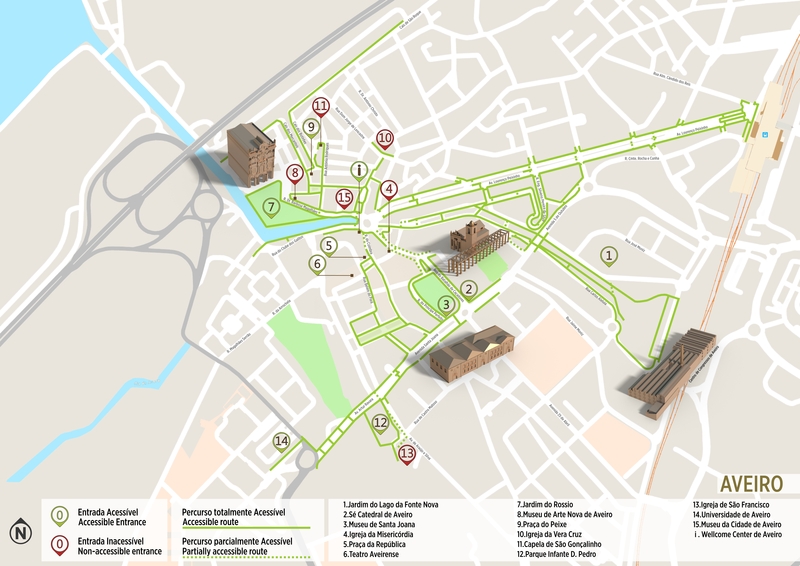 We propose an itinerary that begins on the right bank of the Ria’s Central Canal, in the Jardim do Lago da Fonte Nova (Lago da Fonte Nova Garden) (1), a large open space in front of the landmark building of the Conference Centre of Aveiro, installed in a former ceramics factory. Following Avenida 5 de Outubro, we will find the Sé Catedral (Cathedral) (2), where there is no difficulty entering. Inside you will see examples of sacred art in the high altar and side chapels, produced between the 16th and 18th centuries. Passing 15th-century Gothic cross in the outdoor churchyard, across the street we see the Museu de Aveiro (Aveiro Museum) (3). It is in the old Convent of Jesus, where Princess Santa Joana lived between 1472 and 1490. She was the daughter of king Afonso V and a renowned figure in the history of the city. 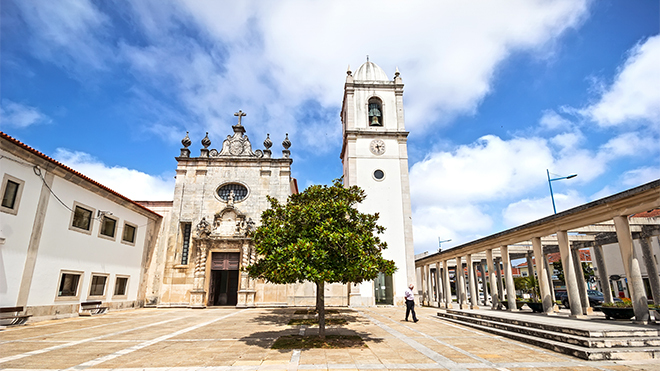 The convent grounds are worth a visit, as is the museum with its collections of Painting, Sculpture, Wood-carving, Tiles, Jewellery and Textiles, dating from the 14th-15th to the nineteenth centuries and coming from convents [dissolved in 1834] in Aveiro and other parts of Portugal. 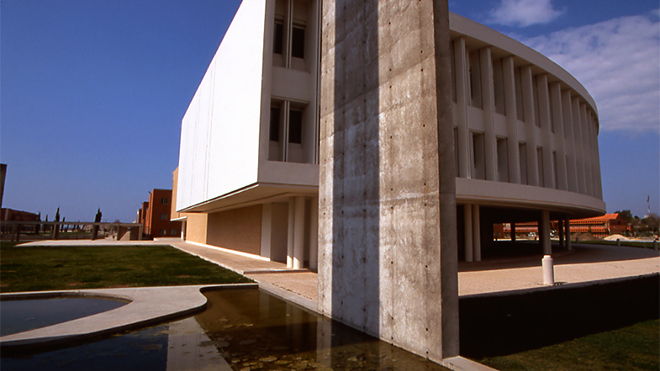 If you keep on along the Avenida do Museu de Aveiro, which here is called Avenida Santa Joana, you’ll come across the Parque Infante D. Pedro (Infante D. Pedro Park) (12), the Igreja de São Francisco (São Francisco Church) (13) and the modern buildings of the Campus Universitário de Aveiro (University of Aveiro Campus) (14), the work of several well-known architects including Siza Vieira, Souto de Moura, Alcino Coutinho, Carrilho da Graça, and Gonçalo Byrne. On the itinerary suggested, we continue to the Praça da República (5), paved in the traditional Portuguese footpath tiles, smooth and without gradients, allowing stable movement. You can go along Rua do Batalhão de Caçadores, which is accessible but has a slight slope, or take smaller streets like Rua dos Combatentes da Grande Guerra. Before reaching the crossing to the other bank you’ll go close to the Igreja da Misericórdia (Misericórdia Church) (4). The interior with its Baroque tile flooring is interesting, but the steps at the entrance make access difficult. Walking across the bridge over the Central Canal, we find the Jardim do largo do Rossio (Rossio Garden) (7), ideal to rest, take a break, enjoy the river, start a moliceiro trip or even have lunch, as there are many restaurants round about and near the Mercado do Peixe (Fish Market) (9). In the Rossio Garden, meanwhile, on Rua Dr. Barbosa Magalhães, you can visit the Museu de Arte Nova de Aveiro (Museum of Art Nouveau) (8), featuring a decorative style that you can hardly fail to notice as you wander around the city. Note the tile façades, the frieze decoration, and the wrought-iron work on the windows and balconies. Continuing to follow the river, going along Rua João Mendonça, you will find the Museu da Cidade de Aveiro (City of Aveiro Museum) (15), with guaranteed accessibility conditions. 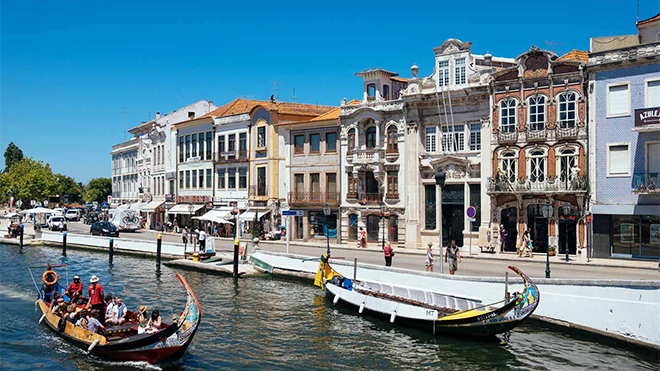 An essential visit for anyone who wants to know more about the history of the city, it also suggests routes in Aveiro, extending the experience of the museum in city tours. Alternatively, you can go back to the Rossio Garden, entering the neighbourhood of Beira Mar where you will find Cais dos Botirões, another of Aveiro’s canals. Accessibility is partial in this area, and you have to use the road along with the vehicles, so you must adopt a preventive and watchful attitude. Nearby is the Capela de São Gonçalinho (São Gonçalinho Chapel) (11), a saint who the Aveiro fishermen venerate deeply, celebrating with a pilgrimage in early January. One of the high points is the moment when the pilgrims pay their promises, handing out cavacas (dried cakes made of egg whites, flour and sugar) to the people gathered around the chapel. Inside, note the curious plant in a hexagon that is repeated in the sacristy. Not far away you’ll find the Igreja de Vera Cruz (Vera Cruz Church) (10). The tile flooring and the carved altarpiece of the high altar can justify a visit. However, entering is hampered by a small staircase. 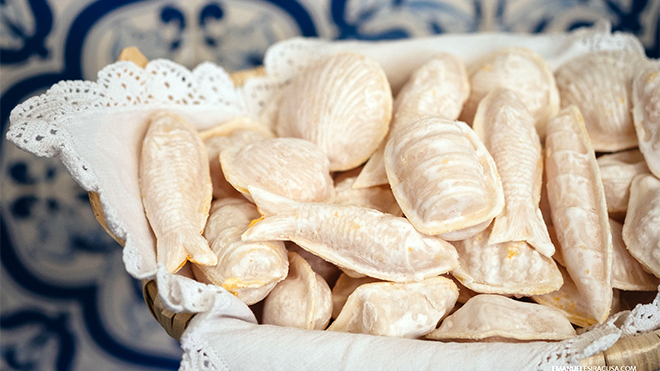 To complete your visit to Aveiro, enjoy the local gastronomy and the regional specialities, such as the convent confectionary in which the ovos moles (egg yolks and sugar mixture) are notable, and are found in all the confectioners of the city. Regarding the Moliceiro tours in the Ria de Aveiro, which are one of the main attractions of the city, some tourist companies make them accessible to people with reduced mobility, especially wheelchair users. Moveaveiro is a company that has some buses with places reserved for people with reduced mobility, platform lifts for access, generous interior spaces, audible announcements, and Braille on the STOP buttons. In any case, the tourist can contact the company and request that the next bus to pass where they are waiting has a platform lift. The bus stop shelters have timetable and fare information. Aveiro railway station is accessible to all. The building has a smooth pavement, escalators for access to the ticket counters, elevator access to the railway platform, adapted toilets and audible and visible warning information for users. However, the ticket counters for people with impaired mobility are not lowered. In Aveiro, some taxi operators do have fully adapted vehicles, so that you can get around the city in a more comfortable and flexible way.